Makita is well known for their construction tools, including power tools for workshop use, but perhaps less well recognised for their outdoor machines, which are equally well built and powerful. Better than that, Makita have spent a lot of time and effort improving and updating their range in significant ways that benefit the user. Take, for instance, the highly efficient new four-stroke engine used on a number of their machines, which can save a lot of money over the lifetime of the tool and help the environment too. 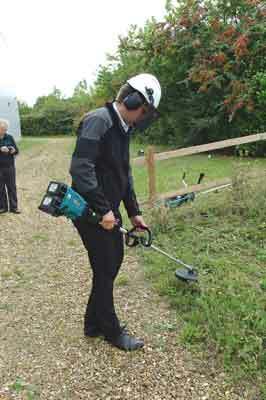 Increasingly, 18V cordless tools are making their mark in unusual ways, because Makita have opted to fit twin 18V lithium batteries to tools that normally require a big expensive, non-compatible 36V battery. You get both the power and the interchangeability and therefore a reduced cost with battery sharing. 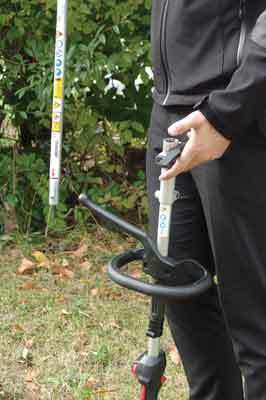 The latest breed of twin 18V tools hold their own - power-wise - in their class. Makita is in the process of beefing up their dealer servicing and spares network, so trade users can not only get quick servicing and parts, but depending on the machine, a set servicing programme rather like a main car dealers, which will ensure the kit stays running and well maintained during the extended warranty period. Below are just a selection from their extensive range, visit the Makita UK website to find out more about the full range. A class leading four-stroke machine incorporating Makita's MM4 four-stroke technology, like their other machines. 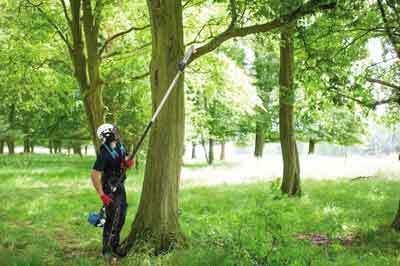 It is just short of 4m, at 3.92m, giving a massive advantage for low as well as high level trim back of hedges and branches with its telescopic action. It therefore gives effectively a 5m reach from the ground and it is economic to run. This 25cc four-stroke machine is easy to start. As with all Makita's four-stroke machines there is reduced running costs, no chance of accidental engine damage caused by the machine being tipped over and no bad cold starts. It can be used with the much appreciated Makita harness, which gives an operator comfort to be able to work all day if necessary. This four-stroke MM4 technology unit teams with any one of five attachments - cultivator, pole hedge trimmer, pole saw, straight line trimmer or bent shaft line trimmer. A great machine for lower level trimming or smaller cultivation work at the snap of a lever for changing tools. 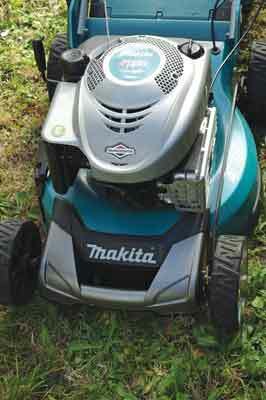 Makita claim it is good for lawns up to 1,800m2, it comes with a Briggs and Stratton 675EX ready start engine and is self-propelled with a three-speed gearbox. It has a 60 litre grassbox and a steel deck. 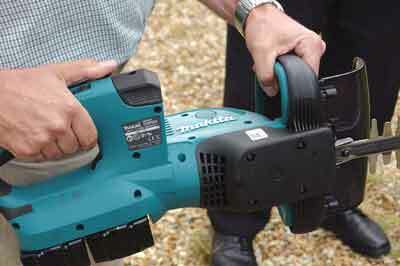 Makita also make a smaller petrol model and an electric push-along scarifier. 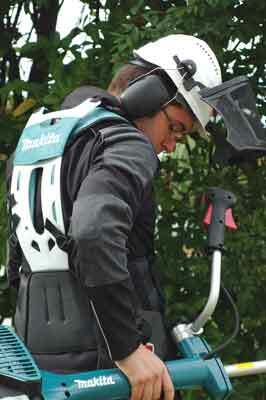 A four-stroke machine benefitting from Makita's MM4 technology. Lightweight and fuel efficient, with low emissions and easy starting and maintenance. It has a 1.08hp output and a maximum airflow of 10.1 m3/min. At 4.4kg it is a comfortable, well balanced machine that doesn't have the tendency, like other blowers, of swinging to the side when switched on thanks to good design. This lightweight, low noise blower uses twin 18V lithium batteries and has a run time of between 24 minutes on the high setting, or 73 minutes on the low setting. Like all twin battery tools in the Makita range, it has a battery capacity indicator, so the user knows the state of both batteries and the tool will always work at the lower charge state. With a net weight of 3.1kg and a maximum air volume of 4.4m3/min this machine competes well with petrol blowers but has lower running costs and weight. 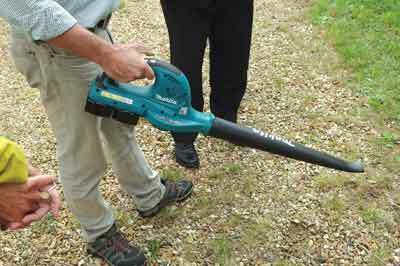 Hedge trimming with a corded tool can be a considerable nuisance, so the Twin 18V machine is a welcome relief. Being relatively light at 5.1kg with no trailing lead, danger of cable snagging or needing an RCD for protection makes this unit a joy to use. Better still, the front body swivels if needed, so your back hand is out of the hedge line when trimming. It features an electric brake and warning lamp for the battery charge state. Again, the light option for levelling awkward grassed areas. It benefits from having Twin 18V batteries and a 5.6kg weight, meaning a harness isn't needed. With a 300mm cutting diameter and brushless motor with variable speed and overload protection this is a useful workhorse where you don't need a hefty petrol model. 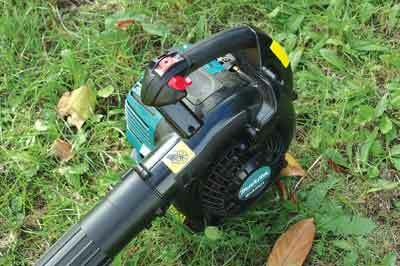 It has a slow reverse feature to unclog grass from the trimmer head. The latest site radio from Makita has 25 watt output and 10m blutooth range!